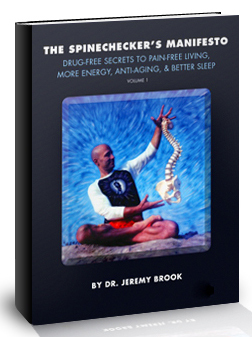 "The Spinechecker's Manifesto is a "rock opera" in comprehensive health awareness. This book strikes a major chord in a sea of health information which typically only scratches the surface on a balanced and complete lifestyle for optimal health potential. Dr. Jeremy’s book includes the most neglected component of superior health which is proper posture and maximum neurological expression. It teaches the basic premises of both time tested practices which include both yoga and chiropractic. This book is a must read book for those interested in attaining a level of superior health and maximum life extension. Truly a masterpiece!!!" "A quick read, page turner, that speaks the simple truth about the sacred importance of the spine in life, health and healing. A ‘must’ read for anyone seeking the true and full benefit of Chiropractic." "I am so glad Dr. J manifested his Manifesto. There is so much in here, yet it's a thin enough volume to not be intimidating. Take what he says to heart and watch yourself become a healthier, more loving, humane human." "A groundbreaking contribution to the field of holistic health & wellness. Dr Jeremy Brook brings together the field of chiropractic and yoga in a way that no one has before. He has a unique vision based on years as a chiropractor and a devoted student of Yoga. He is inspired and well versed on both subjects and he is able to bring alive these teachings in a dynamic and user friendly that inspires as well and teaches at the same time. May this book help many on their path of holistic wellness and bridge east & west, mind & heart, body & soul. Blessings and peace." "After 36 years of being a chiropractic patient, 24 years of being a doctor of chiropractic, and 10 years of training some of the top chiropractors in the world I can say that your book gives one of the best explanations of health, chiropractic, wellness, and yoga I have ever been exposed to. Bravo! Your book explains exactly how the body "works" in a manner that anyone can process. I think your book should be mandatory for ALL health care professionals and for all the people who ever plan on seeking health care advice from ANY health care professional. Your book is wonderfully surprising in its way of making the complex so simple to understand. Making the simple complex is easy --- making the complex easy is genius." "Dr. Jeremy Brook’s The Spinechecker’s Manifesto is a wonderful contribution to chiropractic literature and human potential. It links the truths from the wisdom traditions to common sense wisdom and chiropractic principles! Well done!" Simon A. Senzon, MA, DC,~ Author of Chiropractic Foundations, The Secret History of Chiropractic, and The Spiritual Writings of B.J. Palmer. "I thoroughly enjoyed the easy read of Dr. Brook's book. An inspirational manifesto that provides insightful information about chiropractic. Dr. Brook brings to light how complementary and essential yoga is to chiropractic for maintaining a healthy and flexible spine." "Oftentimes, we see the world from within our own box—it’s human nature. We have to work at it to examine the edges, the corners, the boundaries and see which parts of whatever point of view we’re holding actually serve us and promote health and well-being. Dr. Jeremy Brook has done just that—examined fully the box of chiropractic (including the founding principles of the scientific art) and the box of Yoga, and the bigger box of the human body, as well as what it means to be really healthy. His keen sensibility, sharp mind and inquisitive spirit have penned a manifesto that offers something profound and meaningful for the reader to contemplate, and use as a springboard to question the status quo of mainstream medical information that we’re given and instead, to actually explore what good health really means and how we can cultivate it. The enthusiasm with which Dr. Brook writes is palpable and his carefully thought-out ideas and syntheses of traditions will spark self-inquiry. He’ll inspire belief in chiropractic if you’re a skeptic and encourage you to try a Yoga practice appropriate to your body and situation. The Spinechecker’s Manifesto is a testament to Dr. Jeremy Brook, to the complementary sciences of chiropractic and Yoga and is a welcome addition to current thoughts on health. And…you can’t help but smile as you read it; Dr. Brook’s lively voice offers up ideas that make this worthy of returning to its pages again and again."